The spectacular rice terraces of Batad aren’t easy to get to. But they are SO worth it. I’ve visited lush jungles and pristine beaches. Swam in volcano-studded lakes and ascended mountain peaks above the clouds. But never in my life have I been anywhere that felt more like walking around inside of a painting than Batad. A village so unlike any place I’d seen before, it was difficult to believe it was real. Colors almost incomprehensible to the human eye, brilliant brush strokes all around. These stone terraces carved out of the mountains by hand 2,000 years ago are often dubbed the “Eight Wonder of the World”, and I can see why. Rumor has it, if the countless steps were placed end-to-end, they would reach halfway around the globe. Which is about how far we’d traveled to experience them. We ambled for hours across the narrow rocks, careful not to fall into the pools of growing rice. We shooed away the odd rooster and stopped to greet the occasional pig. We listened to the sounds of village life echoing across the vast amphitheater. It was a day that stands out so sharply from any other, I remember each detail like a vivid dream from which I've just been awakened. And the scene becomes even more dream-like when you make it across the valley, and descend from its highest rim down the back side of this enchanting place. Dense foliage. A steep path. Wet heat and buzzing pests and blazing sunshine. 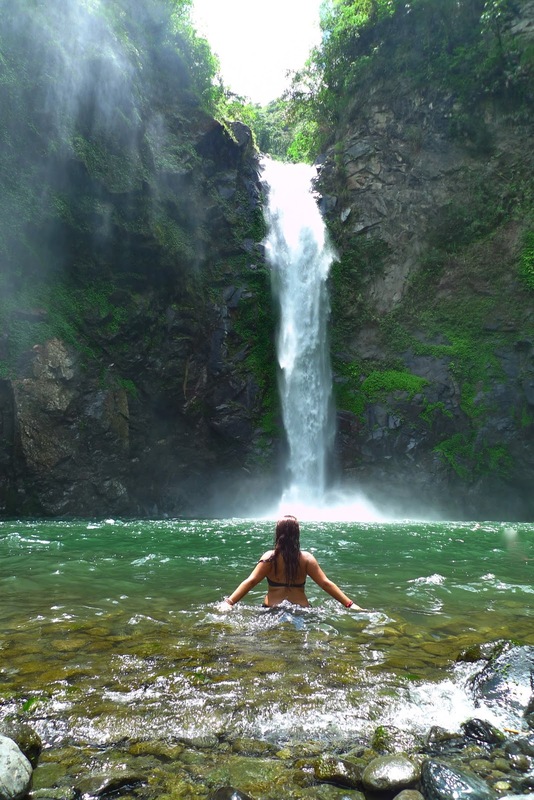 Tappiya waterfall is a favorite local swimming hole, and the dazzling icing on the rice terrace cake. Just when I thought my day couldn't get any better, I kicked off my heavy sneakers, peeled off my sticky clothes, and went for an ice cold swim. Then a boisterous group of local folks insisted that we pose in their family photo. Naturally. Our luck lasted just long enough for us to make the grueling hike back up the hillside, across the terraces, through the small village, and a few miles out over what will one day be a paved road to this secluded paradise. But before we reached our tricycle ride home, the morning's rain returned and we sat, stranded by the storm. For photos of our entire Batad experience, click HERE.